This is a beautiful pair of white mandarin ducks of purity, the most promising activator for PURE LOVE. 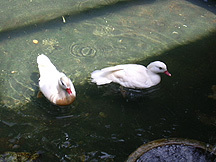 White mandarin ducks are specially known for their purity in love, faithfulness and loyalty. We commissioned them to be made so that they could replicate the same species as that of our very own pair of Mandarin Ducks in our pond, Leo and Geni. Mandarin ducks have been used for centuries as the most traditional symbol of love in Feng Shui practice. The Mandarin ducks signifies love, romance, devotion, fidelity, affection and partner loyalty. 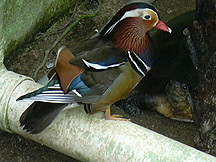 In real life, Mandarin ducks are always seen as loving pairs. The symbols are often used to help singles find love partners in love and eventually marital bliss. Display this pair of mandarin ducks to emit strong love chi that makes you more loveable and attractive to enhance your chances of finding partners. 1. Display the Mandarin ducks in the southwest location of your bedroom, living room, dining, family room, your car and even your workdesk. Southwest is the universal love sector according to Life Aspiration Theory. 2. Next, you may also want to check out your personal love direction according to your kua number (based on your birthdate) to activate your Nien Yen direction. This is in accordance with 8 Mansions Theory of Feng Shui.